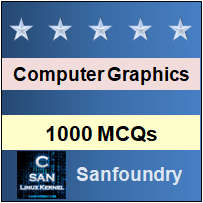 This section of our 1000+ Computer Graphics multiple choice questions focuses on 2D Scaling. Explanation: Scaling is used to alter the size of an object. Explanation: The 2d scaling equation is P’=S*P.
Explanation: Scaling of a polygon is done by computing the product of (x, y) of each vertex with scaling factor sx and sy to produce the transformation coordinates ( Xnew, Ynew). Explanation: If the scaling factors values sx and sy < 1 then it reduces the size of object. Explanation: When sx and sy are assigned the same value then uniform scaling is produced that maintains relative object proportions. Explanation: Unequal values for sx and sy results in differential scaling that is often used in design applications. Explanation: The objects transformed using the equation P’=S*P should be scaled and repositioned. Explanation: sx=sx=1 does not change the size of the object. 10. The polygons are scaled by applying the following transformation. Explanation: The polygons are scaled by applying the transformation X’=x * Sx + Xf(1-Sx) and Y’=y * Sy + Yf(1-Sy).